Images by Didier Hillaire / Worlds official fb page, full gallery here. 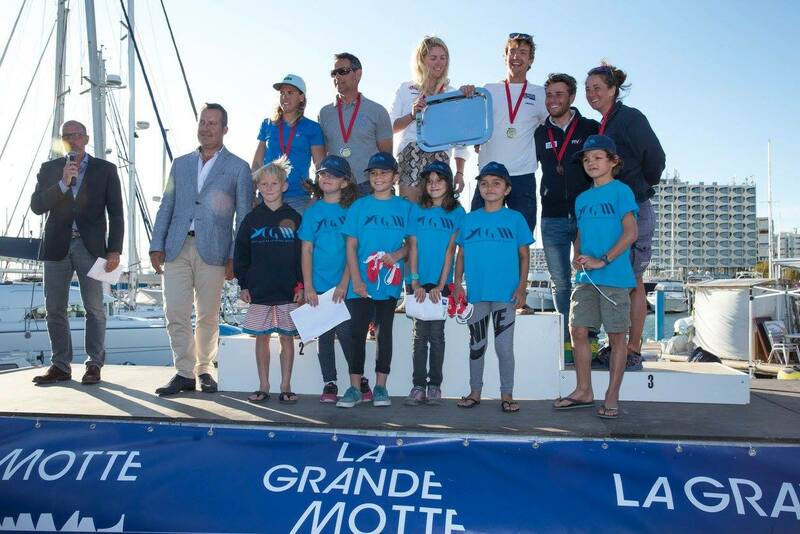 Photo Left the Future of the Argentine Sailing scene, but specially multihulls , Mateo Madjalani & Eugenia Bosco, the kids getting their Junior 3rd place. They finished 14th overall tying in pts with the Olympic Champs Lange & Carranza, and were inside the top ten overall during the Gold Fleet races too. So happy for these two, we will following their campaign with special dedication and support. First Nacra 17 MKII Worlds for Ben Saxton & Katie Dabson, great rewards for them, the entire British Team, and also for their coach, Hugh Styles (photo below), one of the fastest sailors ever in the F18 fleet. The British have been performing since early days and always putting several boats in he top ten, Ben couldn't grab a medal at Rio, but still young and this title along Katie will fuel their drive towards Rio. 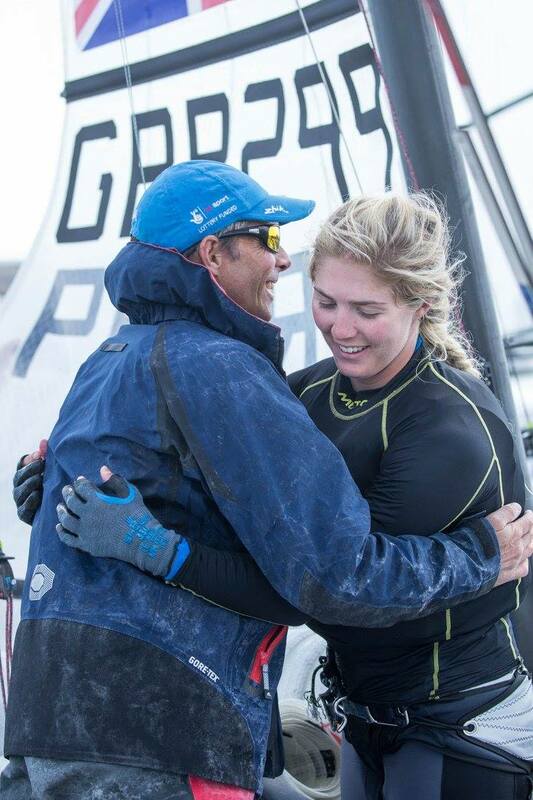 Also hats off to Echavarri & Pacheco, the 2008 Tornado Gold Medalist & Tara lost the title over the line! From Beijing 2008 floating mode to a Foiling photo finish in 2017 , way to stay competitive for Fernando. 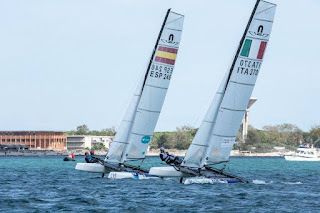 Read the official report below as the Medal Race had plenty of action, watch also sequence above where Title contenders Tita & Banti hit Martinez-Maslivets. Don't why they didn't get a redress if fault came from the Italian crew, who did well and withdraw from the final aside breaking their bowsprit. Iker also adapting quite well to the new Class, and they could have finished in 4th place. For the Nacra 17 MKII it was a good debut in the end, still much to work on and define (Spi upwind and else) , but aside the known things by now on the MKII, it seems all went rather well, at least I don't have reports on any major break or failure, and they had several +20knots races during the week, including the Medal. 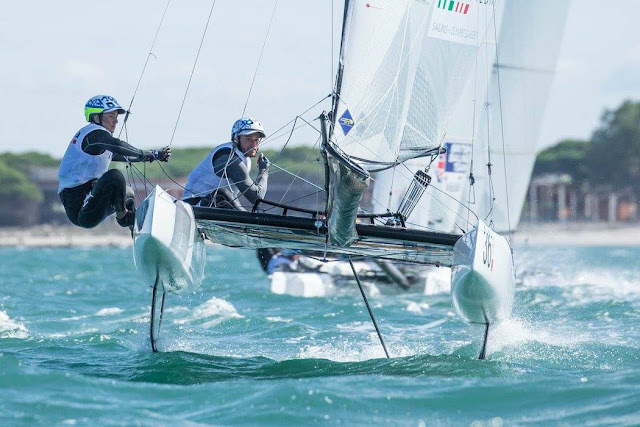 "From the closest and most exciting finish to a world championship Medal Race in the Olympic history of the mixed multihull class, foiling at full speed across the finish line Great Britain’s Ben Saxton and Katie Dabson pipped Spanish rivals Fernando Echavarri and Tara Pacheco, to win the 2017 Nacra 17 World Championship title on the French waters of the Baie d’Aigues Mortes by La Grand Motte. “When we were coming towards the top of the second beat I said to Katie ‘world champions, all we have to do is pass that boat. 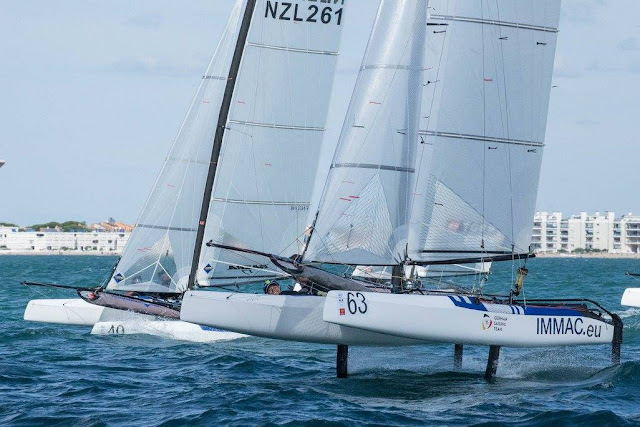 So we were gunning it down pretty hard, we really went for it.” Reported helm Saxton who has been in the Nacra 17 since 2013 and was runner up for the World Championship title in 2013 in The Hague. 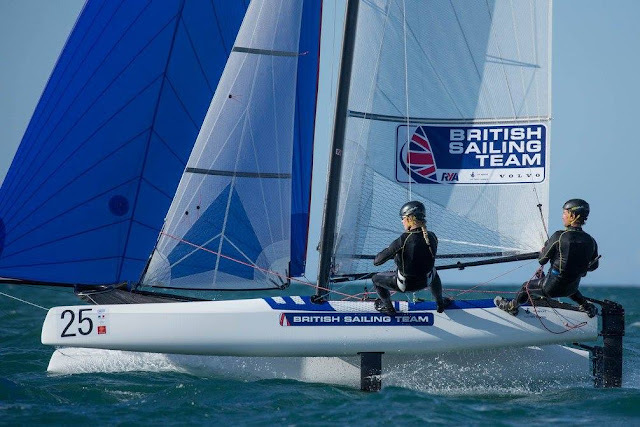 After a disappointing ninth at the 2016 Rio Olympic regatta Saxton paired up only in May with childhood friend Dabson, a Plymouth University BA Hons graduate in Accountancy and Finance who -inspired by the 2012 Olympics in Weymouth - only went into full time sailing after completing her degree. 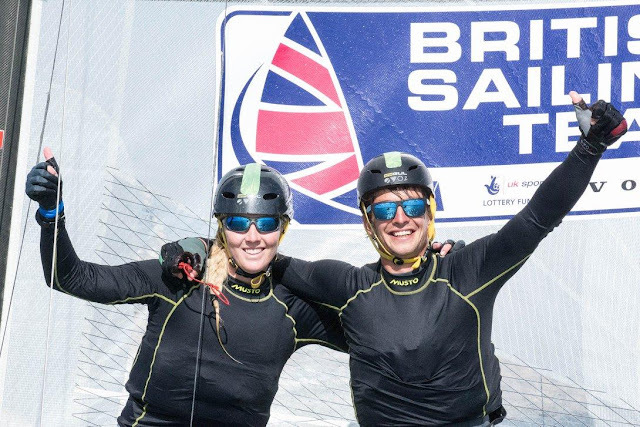 The new world champions have been friends at England’s Grafham Water Sailing Club since they were cadets and their fathers race a Flying 15 together on Wednesday nights. 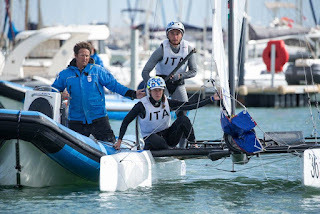 In the gusty, offshore, up and down 11-22kts breeze Tita and Banti tangled with Spain’s Iker Martinez and Olga Maslivets approaching the first winward mark. 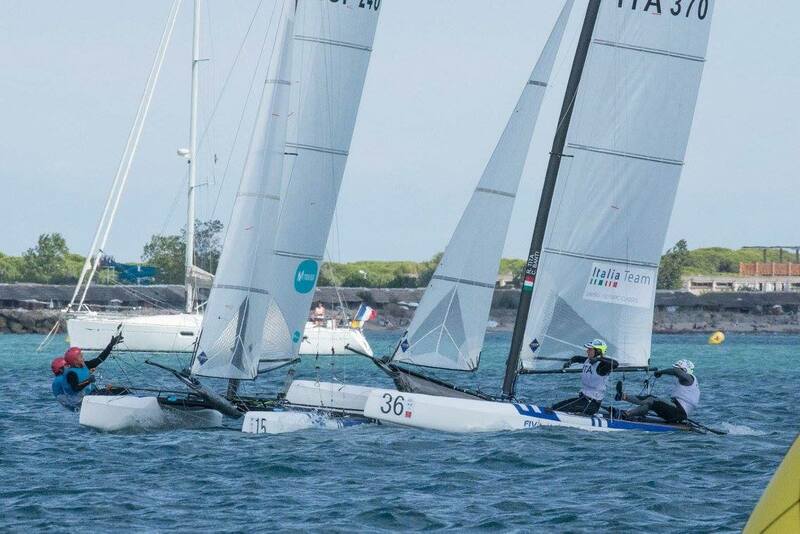 Martinez and Maslivets were dismasted and neither pair could complete the Medal Race course. “We were arriving at the top mark and were below the mark so we needed two more tacks but there was not enough space to clear Iker. 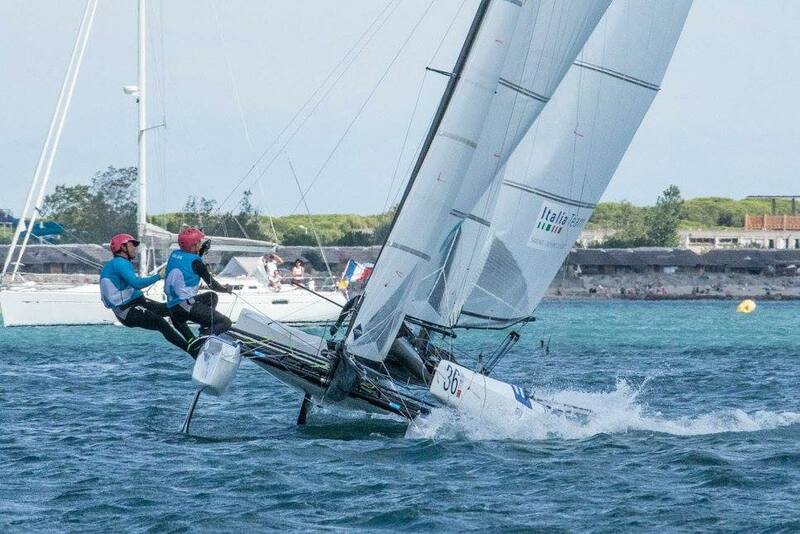 We tried to stop but we hit them, our bowsprit got stuck on their trapeze and ten seconds later their mast broke. It was a really big mistake on our part. We had a really good week but could have done better. Third place is not gained with a smile, we deserved to do better.” Said European champion helm Tita. 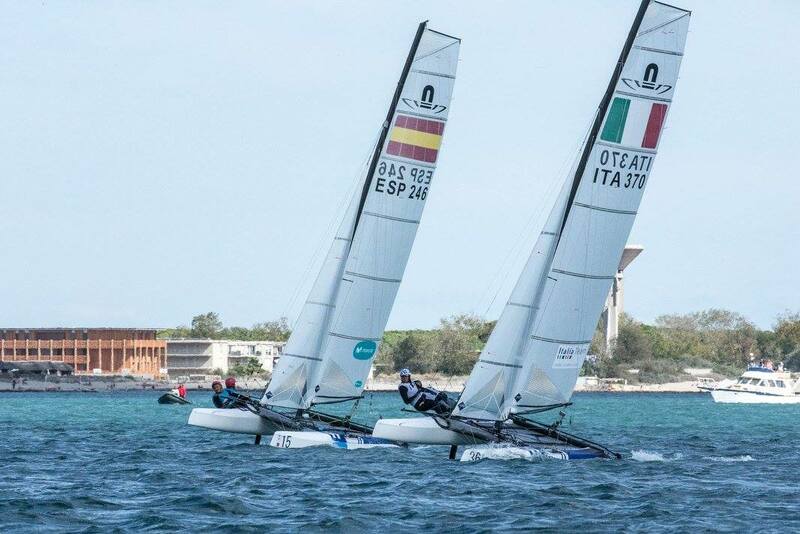 The Medal Race in the gusty breezes and flat water was a perfect arena showcase finale to the 2017 Nacra 17 World Championships. Ironically at the first post Olympic meeting of all three 2016 Rio medal winners none made the cut into the top ten qualifiers for the medal race. 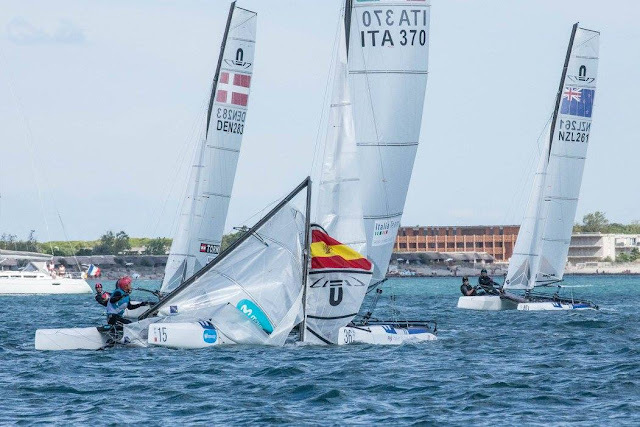 Australia’s silver winners Jason Waterhouse and Lisa Darmanin finished 11th and Argentina’s Santi Lange and Cecilia Carranza – who scored a BFD in the penultimate race – finished 13th. 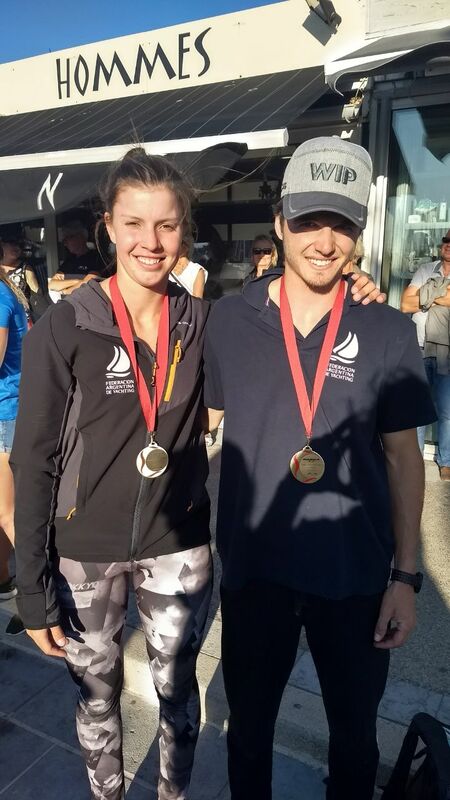 New Zealand’s Gemma Jones and Jason Saunders won both the last Finals races today prior to the Medal Race and finish fourth overall, repeating their Rio finish. 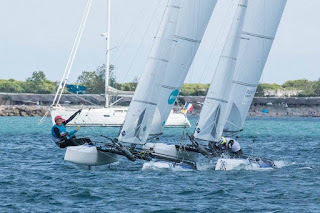 FLYING It was appropriate in the first flying, foiling Medal Race that Saxton and Dabson clinched the title at maximum speed, fully foiling down the last part of the last run to steal second place. 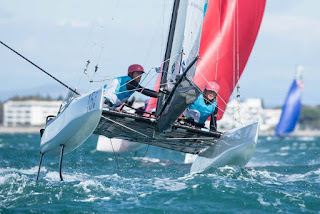 Germany’s Paul Kohlhoff and Alicia Stuhlemmer lead from the first mark and won the medal race to finish fifth overall. “I was really gutted after the Games. 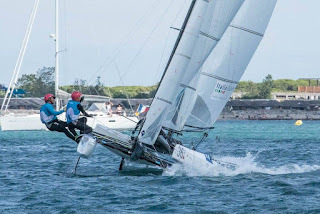 I had given it everything and have no regrets but we were in a medal position for the first half of the regatta then we had the worst score for years. We were happy with the programme we put together. 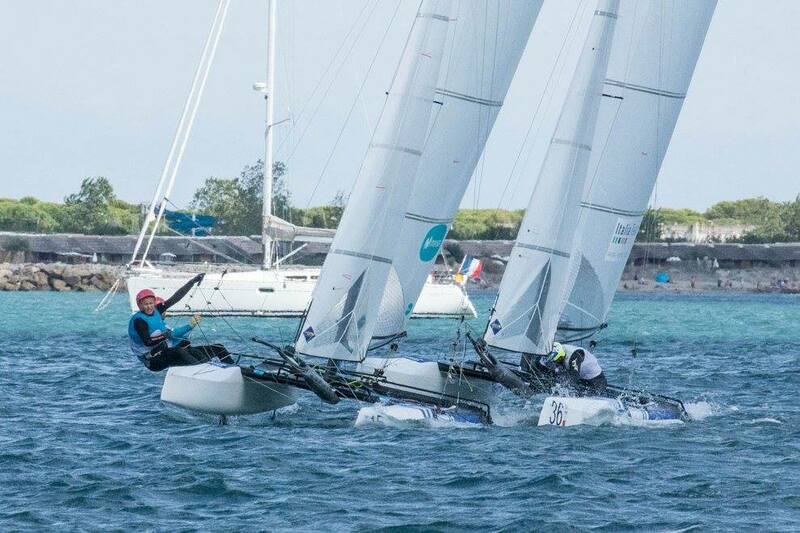 Nic wanted to earn some money and did not want to 31 and pulling a Nacra mainsheet in. She was happy to have been to the Olympics and wanted to move on to her job in London. I have been full on since January. I have done all the events to stay racing sharp.